There are various models of the commissioning cycle. For example, the NHS model uses nine elements within three broader stages – strategic planning, procuring services, and monitoring and evaluation. The Institute for Public Care model is based upon four key performance management elements – analyse, plan, do and review. The National Audit Office (NAO) model highlights those elements of the commissioning cycle where we think that a good relationship with third sector organisations (TSOs) has a significant impact on helping commissioners achieve good value for money. Our guidance is organised around these elements. A text description of the model (pdf – 21KB) is available. TSOs vary greatly: some are community or user-facing organisations; some have an advocacy role, either alone or as part of wider services to the community and users; some work in partnership or as federated bodies; and TSOs also vary in their size, from volunteer-led community groups to large national organisations, from small self funded bodies to major social enterprises. It is partly this variety that enables the sector to bring the benefits that it does to delivery of public services. 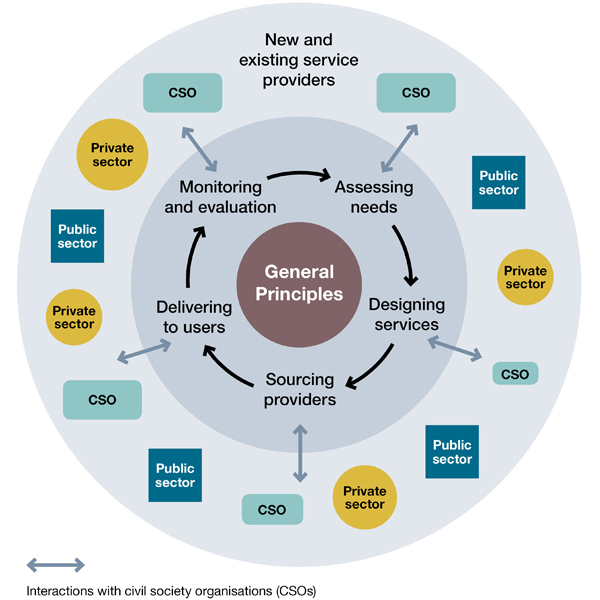 Although the model describes TSOs (and others) as service providers, many TSOs have an important role as advocates for the needs and services required by those people that commissioners have to provide for. We say more about this under ‘Assessing Needs’. Next: What are third sector organisations and their benefits for commissioners?